Powered by sunlight, realizing energy saving. Automatically turn on and off when at dusk and dawn. Easy to install, no wires needed. no worries about raining, snowing, frosting. Working Time: 6-8 hours lighting time after 6-8 hours full direct sunlight charging. 1. There's a tab on the underside of the light cap. Please remove the tab before first use. 2. Please put the solar lights in a place where can get FULL and DIRECT sunlight during the daytime to charge the solar lights fully. 3. If the light does not work at the first time you use, please turn on the light and then put it under the sun for 6-12 hours. The light should work again after recharge it. No electricity needed, absorb full direct sunlight to charge about 6-8 hours, can provide 6-8 hours illumination, realizing energy saving. Lumens: 2 lumens. Measures: 2.4×2.4×13.5 inches. Clear plastic lens provides pretty light effect on the ground, the classic shapes and materials make your garden beautiful at night with lighting lights. Remove the tab under the light cap, pull out the bottom spike from the tube, install it and insert the light into the soft earth. The solar pathway lights automatically turn on at night and turn off at dawn. No worries about raining and snowing, the light can work normally under all kinds of weather with the waterproof rating of IP44 and weatherproof. It is important that the solar panel is kept free of dirt, debris or even snow. 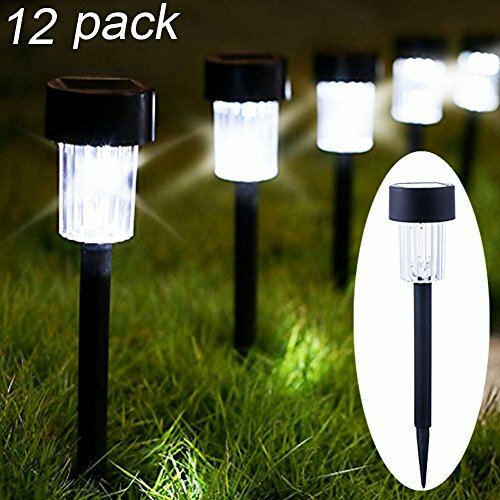 Suitable for outdoor way, arbitrarily decorate and light your garden, patio, porch, yard paths and walkways, illuminate the way for you to home after working late at night.